After this past weekend's Yoga Teacher Training (15 hours thankyouverymuch), I now have enough knowledge under my belt to teach a full one-hour class! The entire power vinyasa sequence developed by California Power Yoga is 3 hours long... so, dare I say it?.... I'm one-third of the way there! Now the trick is getting the sequence to stay in my memory. Last week I taught two private lessons using a 30-minute sequence and I still had to use the book to remember what came next. The poses may be ingrained in my muscle memory but when I'm standing up there in front of the class just watching, it is soooo hard to remember which pose to direct them into next. Which brings us to yesterday. 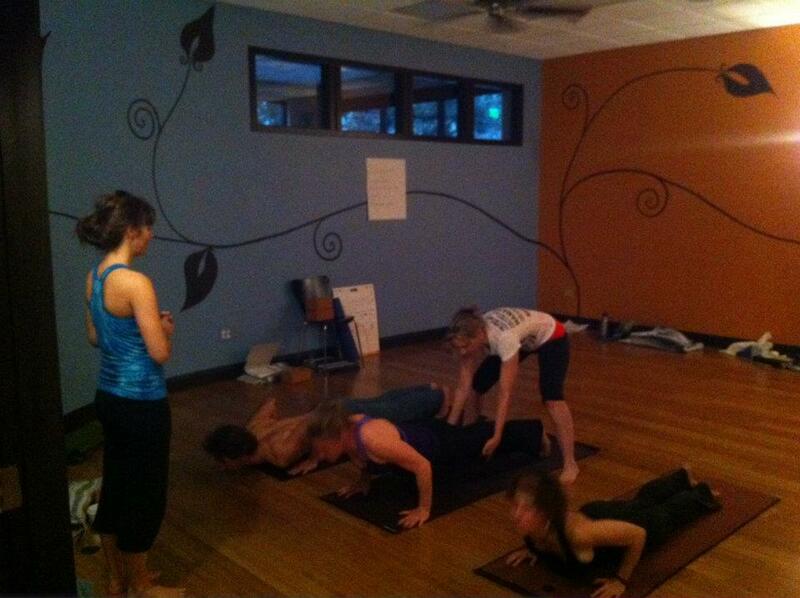 Between classes I marched my manual and myself into the studio and guided my TEACHER through a one hour yoga class. Holy nervousness! But the amazing thing is no matter how nervous I am before going into a class, as soon as I stand up in front of the group and begin speaking, the nervousness fades away and I feel ALIVE. Public speaking is not a problem for me. In fact, I LOVE it. Weird, right? Nope! As a wee tot I started public speaking competitively and continued through college into my career as an ecology teacher. But then, drat! I landed a pesky desk job which suppressed my passion for speaking in front of large groups. The mantra "you can't do it" was nailed into my head daily and it turned me into a shy un-driven person. A person can't shine if their skills and passions are continuously overlooked and ignored. Since I've been out of that lifestyle since June, I've had a lot of time to figure out who I am. But it wasn't until Yoga Teacher Training started in January that I finally found my voice again. The first training weekend I would instruct my students in a small voice, "take child's pose". Now I stand firm and proudly state, "Inhale upward dog. Exhale downward facing dog!" So yes, I was a bit nervous about teaching my teacher. But once we began the class I felt powerful and KNEW that this is exactly where I need to be.